I hope you'll consider joining Waynesville High School Interact Club as we raise money to fund a water project. On Saturday, April 22, 2017 at 10:00 am. we will "Walk for Water". Students and volunteers will be bringing gallon jugs and buckets to the Waynesville Middle School and do as so many are forced to do in the developing world. 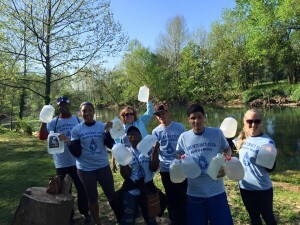 The students/volunteers will walk to the Roubidoux and draw potentially polluted water from the creek and carry it back to the middle school. Help us by donating on behalf of a student or friend making the trek. With your gifts and your help rallying support, we can provide clean, safe and reliable water to a community in Africa. 04/04/17 Frances Dutchuk $70.28 Way to go WHS Interact!! !